Within hours of the attack, Françoise Mouly and Art Spiegelman went to work to create the famous black-on-black image—that almost didn't happen. On September 11, 2001, after witnessing an airplane crash into one of the Twin Towers, Françoise Mouly faced two imperative tasks: First, she had to find her kids, and then she had to come up with a New Yorker cover to somehow mark the event. That day, Mouly and her husband Art Spiegelman, the cartoonist best known for his graphic memoir Maus, were walking out of their SoHo loft, just 10 blocks north of the World Trade Center, planning on voting in the city’s Democratic mayoral primaries, when they saw the first plane hit the North Tower. Mouly, who's been the art editor of the New Yorker since 1993, initially assumed it was an accident, a leisure plane going off course maybe—it was the only thing that made sense. What she calls her “journalist’s instincts” kicked in, and she called David Remnick, the editor of the New Yorker since 1998, and told him to turn on his TV. The couple’s daughter, 14-year-old Nadja, had just started classes at Stuyvesant High School, four blocks from the towers. Worried that debris might land on the school, the anxious parents rushed to find her. Locating her wasn’t easy—the 10-story school building housed more than 3,500 students. While they searched, Spiegelman overheard a Spanish-language report from a janitor’s radio saying that the Pentagon had been attacked. Then the lights went out, and the building trembled from the collapse of the South Tower. Spiegelman was sure they would all die in the school. After continuing to search for an hour and a half, they found Nadja. As they were leaving Stuyvesant, the North Tower crumbled behind them. Spiegelman, meanwhile, was making an image that contrasted the lovely fall weather of that day with the horrible event that happened, with the towers covered in a Christo-like black shroud against a Magritte-style blue sky. Every time he walked between his studio and the loft, Spiegelman would look where the towers had stood. Like a phantom limb or a ghostly presence, they were both there and not there, felt but invisible. Remnick, for his part, was considering the use of a photograph—it would have been the first time in New Yorker history and a precedent-breaking way to register such an immense historical event. There were a few last-minute hitches before the cover ran. Late Thursday night, rumors circulated that another magazine might also be doing a black cover. Mouly argued that her cover wasn’t just black but contained a subtle image that set it apart. Fortunately, word came back that the other weekly was going with a photo cover. By Thursday, Mouly finally had Greg Captain, her trusted prepress expert, on the premises. Because of the subtle effect the cover had to achieve, Mouly scrambled to work with her prepress crew to make sure that the ink densities were sufficiently different to capture the contrast between the two almost identical shades of black. Art Spiegelman was the President of the Angoulême Comics Festival in 2012 (in effect, a guest of honour who helps organize the show and is celebrated with a special exhibition). When the origins of the 9/11 cover were explained to the French Minister of Culture Frédéric Mitterrand, who was looking at a large-size print, he responded by calling it “une idée de génie.” It’s true that the idea is genius, but so is the execution. It was a true example of collaborative art. 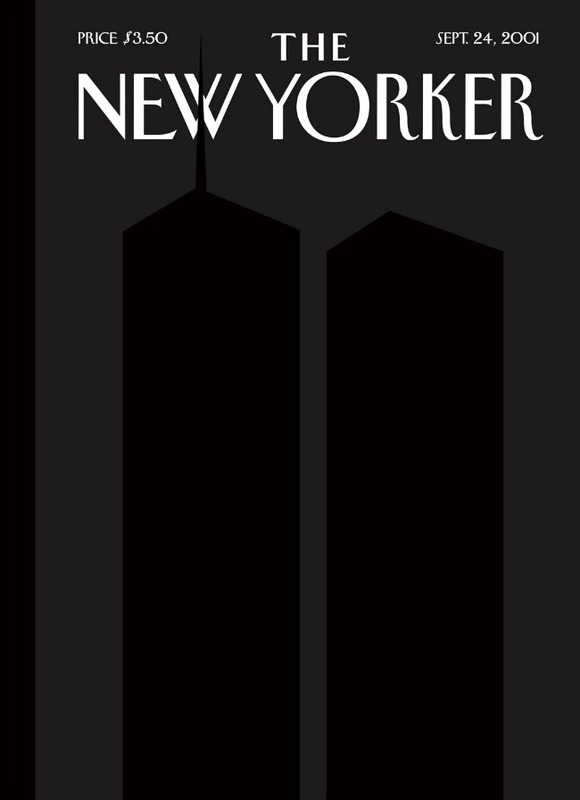 Many of the hallmarks of Mouly’s tenure as New Yorker art editor can be seen in the 9/11 cover, including a direct engagement with current events—an enormous tonal shift in New Yorker cover history. But the cover doesn’t deal with this tragedy in the didactic manner of, say, a political cartoon, but rather through artful means: using subtlety and ambiguity, strong design, a compelling use of color (or in this case, a memorable absence of color) and the distillation of experience (rather than ideas or ideologies) into an iconic image. The dialogue between Mouly and Spiegelman was also typical of the strongly collaborative way she always has worked with, and continues to work with, her artists. I asked Mouly why she’s only recently been willing to talk about her accomplishments as an editor, not just on the 9/11 cover but her wider achievements both at the New Yorker and her earlier tenure as co-editor of RAW (a hugely influential avant-garde comics magazine she and Art Spiegelman edited from 1980 to 1991). This post is adapted from In Love With Art: Françoise Mouly's Adventures in Comics With Art Spiegelman.